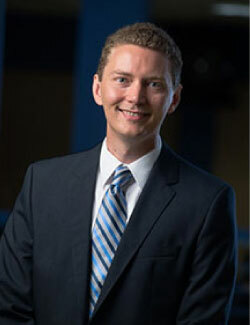 John Deskins serves as Assistant Dean for Outreach and Engagement, Director of the Bureau of Business & Economic Research, and as Associate Professor of Economics in the College of Business & Economics at West Virginia University. He leads the Bureau’s efforts to serve the state by providing rigorous economic analysis and macroeconomic forecasting to business leaders and policymakers across the state. He received his PhD in Economics from the University of Tennessee. Deskins’ academic research has focused on economic development, small business economics, and government tax and expenditure policy, primarily at the US state level. His work has appeared in outlets such as Contemporary Economic Policy, Public Finance Review, Economic Development Quarterly, Small Business Economics, Public Budgeting and Finance, Regional Studies, Annals of Regional Science, Tax Notes, and State Tax Notes, as well as in books published by Cambridge University Press and the Lincoln Institute of Land Policy. He has delivered more than 100 speeches to business, government, and community groups and his quotes have appeared in numerous media outlets such as The New York Times, The Washington Post, Bloomberg, CNBC, National Public Radio, and PBS. He has served as principal investigator or co-principal investigator on more than $1 million in funded research.